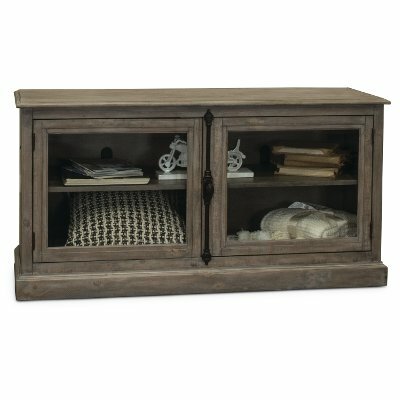 Available now at RC Willey, you can enjoy this washed gray 2 piece modern entertainment center. Give your TV a brand new home in this beautiful set. Featuring a top shelf that has two LED lights and three way touch lighting controls, this piece is set to make your most prized possessions shine. No more worrying about messy cords either! Both the hutch and stand have a wire management system in the back panels to keep your TV and gaming system cords contained. Complete with an adjustable shelf behind wood paned glass doors, you will find this piece an essential part of your living room. Now at RC Willey, you can find this 61 inch gray TV stand. Featuring an adjustable shelf behind wood paned glass doors, this stand is sure to meet all of your organizational needs. With a wire management system in the back panel, this stand allows you to contain the clutter of cords from your TV and gaming systems.